Somewhat old news, but worth a mention … ~84 days ago, we favorited this Tweet knowing that when we relaunched we’d post about Rake’s jump from version 0.9.6 to 10.0.0. 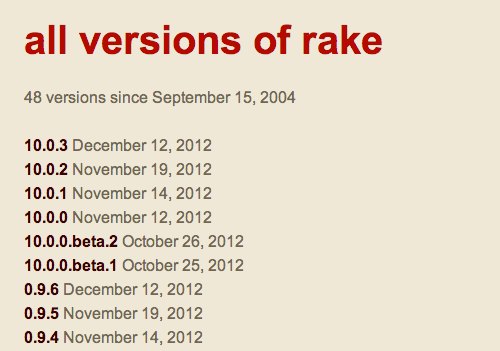 Also, below is a screenshot of Rake's version history shown at RubyGems.org. Notice the jump from 0.9.6 to 10.0.0.beta.1. What's up with that? Over the past several years I’ve been asked that question at conferences, panels and over twitter. Due to historical reasons (or maybe just plain laziness) Rake has (incorrectly) been treating the second digit of the version as the major release number. So in my head Rake was already at version 9. Well, it’s time to fix things. This next version of Rake drops old, crufty, backwards compatibility hacks such as top level constants, DSL methods defined in Object and numerous other features that are just no longer desired. It’s also time to drop the leading zero from the version number as well and call this new version of rake what it really is: Version 10. So, welcome to Rake 10.0! At The Changelog, we love semantic versioning, and this is a case where the change was the right move to make!